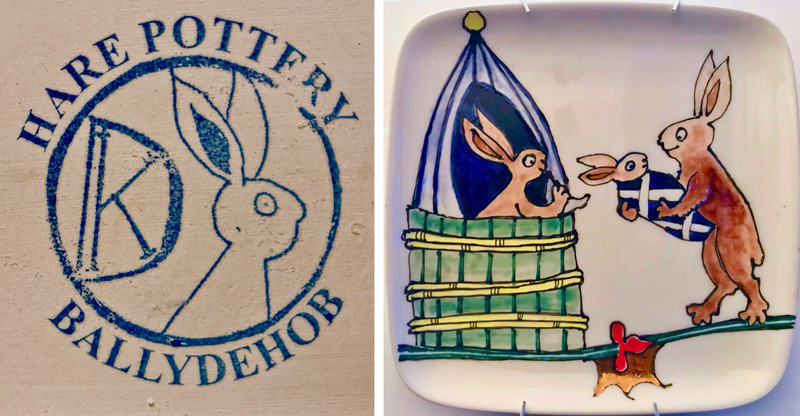 Writer, sculptor, ceramicist, historian . . . the creative community here in West Cork rolls all these things into one person: Kay Davenport. 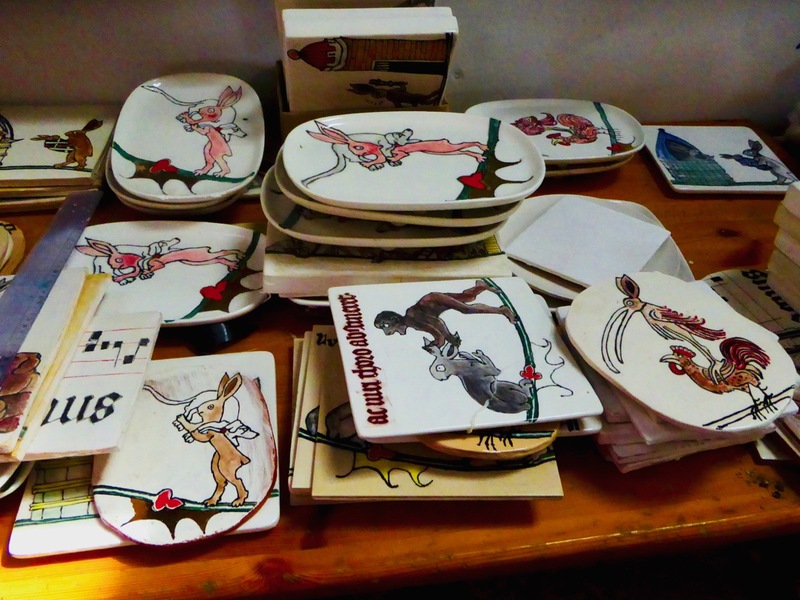 For me, another side to Kay is one of the most important – she is, like me, a complete Hare Fanatic! 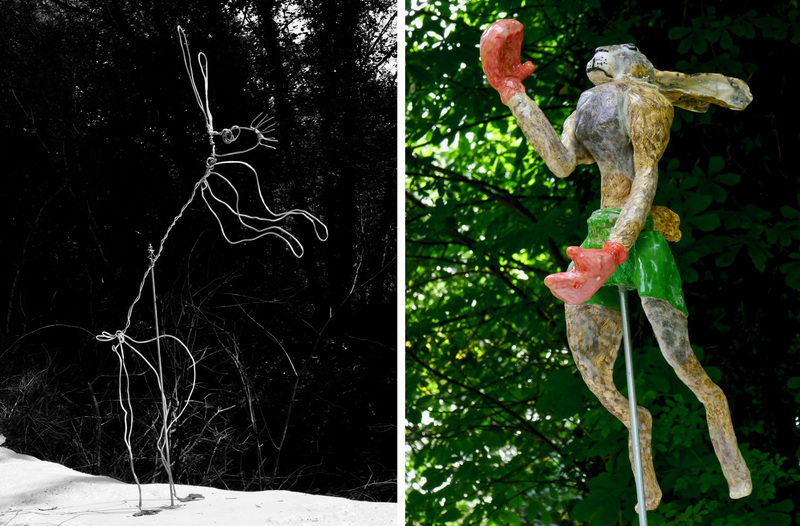 You can tell because, when you drive past her entrance gates on the road between Ballydehob and Bantry, you are greeted by some wonderful hares which she has sculpted.
. . . the hare is a principal actor and unique in these books in her animosity towards the hunter/tailor who would kill her for her pelt to line hoods and cloaks. 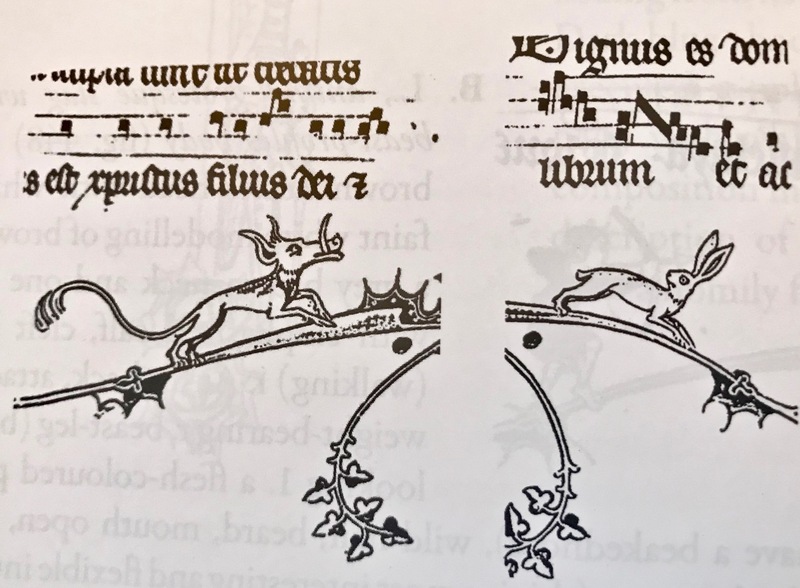 A number of marginal scenes revolves around the subject of the hare exacting revenge on the hunter and these could be described as the hunter hunted or the world upside down. The hare is also shown fighting with her old adversary, the hound, using shield and sword, or defending a castle against him and his troops. In one instance, the hare triumphs and bears him home, presumably to eat . . .
2018 has heralded new ventures. She has become a prolific writer! 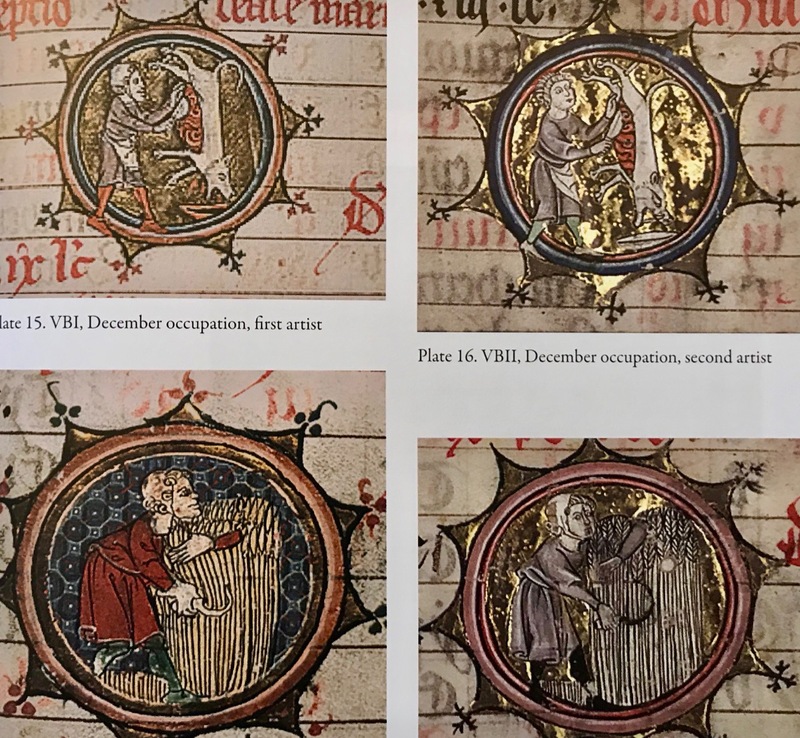 Firstly, in March of this year she released a magnum opus: The Bar Books – a completely comprehensive study of the manuscripts illuminated for Renaud de Bar, Bishop of Metz between 1303 and 1316. 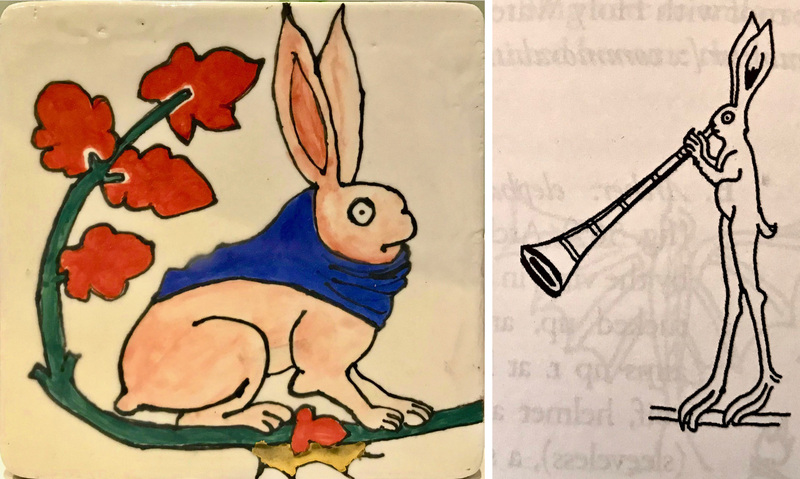 It is these manuscripts that contain the hare marginalia which have always fascinated and inspired Kay. 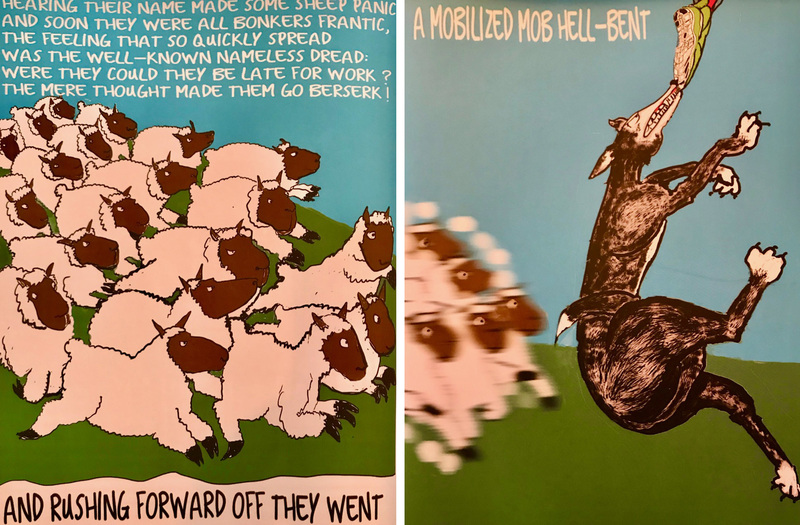 The study is about far more than the marginalia – it’s a very concentrated slice of a very particular historic period and a way of life lived then; and the book contains 242 black-and-white illustrations and 45 colour plates. 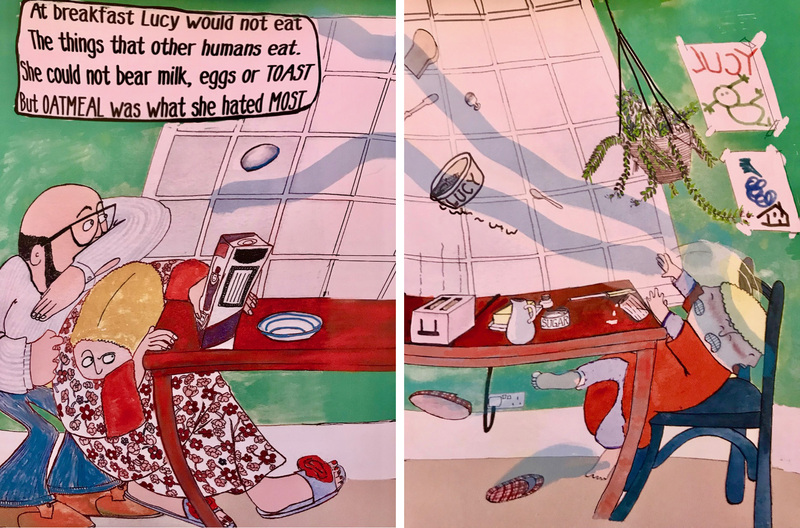 As if such a magnificent achievement wasn’t enough for one year, Kay has surprised us all by suddenly launching a series of illustrated books for children – and just in time for Christmas! 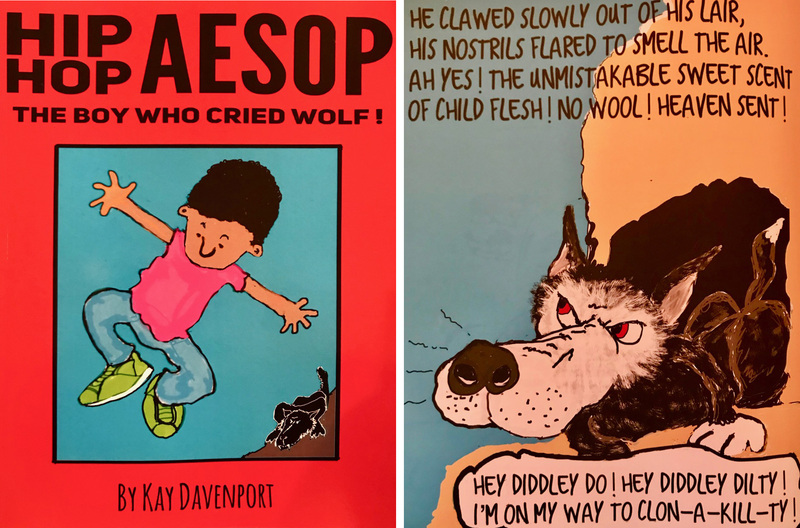 But it would be wrong to say that these books are only for children: we were thoroughly entertained by them – as will anyone be who has a sense of humour. And the suitable age group? Well, my grandchildren who range from 8 to 18 will be getting them – and enjoying them, I have no doubt. After all, there are terrible toddler tantrums, fierce wolves, and a hip-hop hero – what more could anyone want? 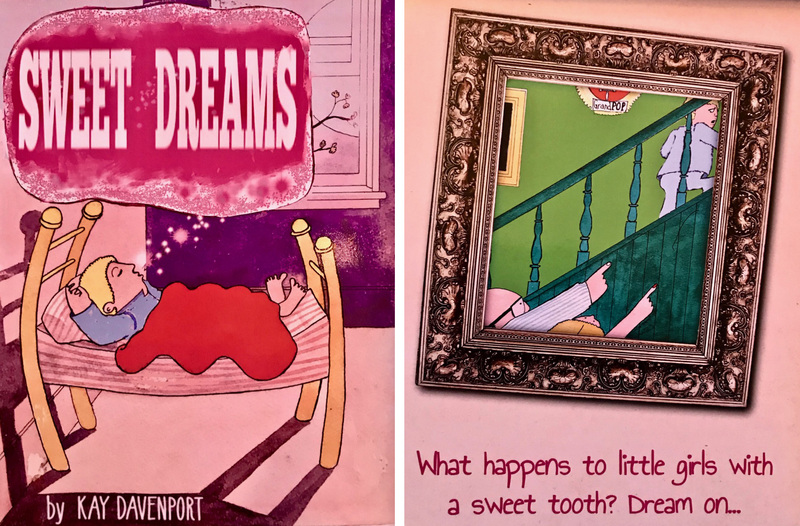 Above: the covers and a page from Sweet Dreams, in which a nightmare of a child learns the pitfalls of eating too many sweets. Kay’s rhyming text and illustrations are hilarious. 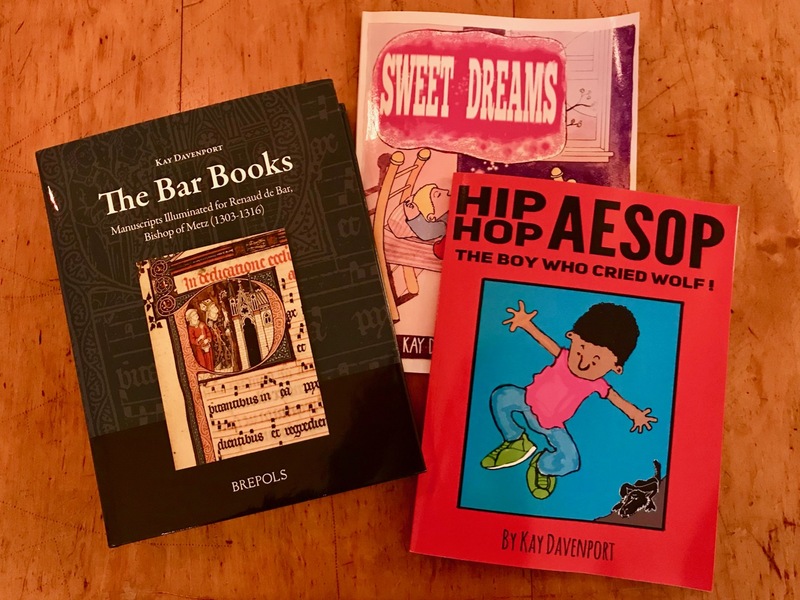 below, the book Hip Hop Aesop – a wonderfully unique variation on the ‘cry wolf’ story. 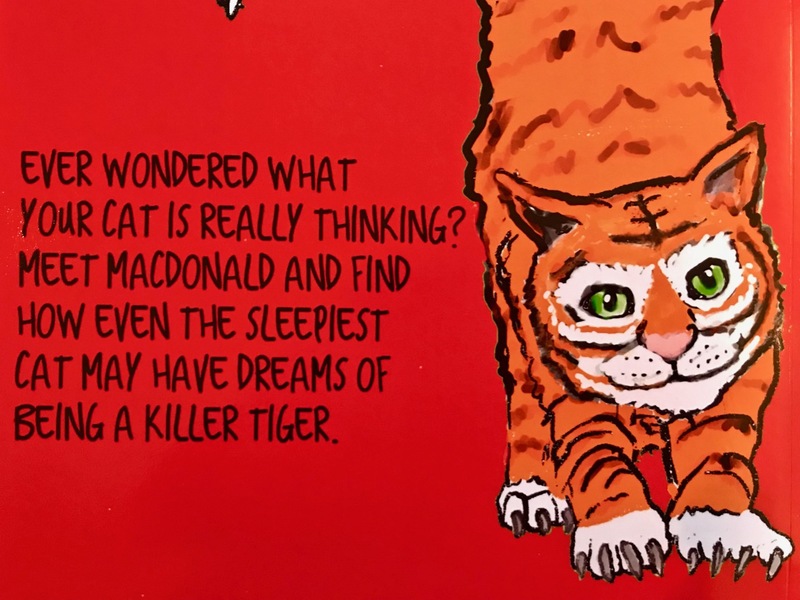 Just to add to the melee, Kay has also provided the illustrations for a book by Michael Neill, Macdonald the Tiger. 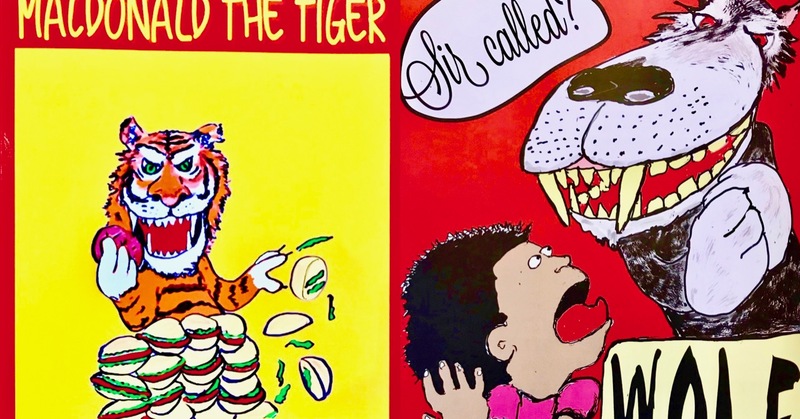 In my household, we always had to have books about tigers – especially those who ate children. This one would certainly have fitted the bill – and a few mothers get eaten along the way, too! But all ends well, of course. Well, I hope this post has inspired you to go out and get some of Kay’s work. The books are available from Amazon, and they are also on sale in the Post Office in Ballydehob – what an easy way to fill your Christmas stockings!